Over the past few years I’ve been seeing an alarming increase in the number of patients with shoulder problems and pain, namely rotator cuff and labrum tears. Most of these patients are between 40-55 years of age. And not all athletes. Some are weekend warriors, other exercise regularly, some doing pilates and yoga, and still others are just doing life. But I have a theory as to why this is all happening to us at this point in our lives. I believe we are demanding much from our bodies. We workout, train, lift, garden and continue to feel like we did 20 years ago, yet our shoulder joint is beginning to break down. Poor posture, work habits at the computer and overuse may all be contributing factors, but the pain is now making us pay attention. So what is the rotator cuff and labrum? And what can we do to prevent and rehabilitate ourselves? Wikipedia describes the rotator cuff as the group of muscles and their tendons that act to stabilize the shoulder. The four muscles of the rotator cuff, along with the teres major and the deltoid, make up the six scapulohumeral (those that connect to the humerus and scapula and act on the glenohumeral joint) muscles of the human body. Wikipedia also describes the glenoidal labrum (glenoid ligament) as a fibrocartilaginous rim attached around the margin of the glenoid cavity in the shoulder blade. The shoulder joint is considered a ‘ball and socket’ joint. However, in bony terms the ‘socket’ (the glenoid fossa of the scapula) is quite shallow and small, covering at most only a third of the ‘ball’ (the head of the humerus). The socket is deepened by the glenoidal labrum. Typically patients experience pain on the outside of the shoulder with rotator cuff injuries and deeper pain with labrum tears, along the joint line. Both types of injuries are exacerbated with overhead usage of the arm. Night pain when sleeping on the effected side is also a common symptom. Usually injuries to the shoulder in the elderly result from a slip and fall, or repetitive movements. The younger population typically injury these structures with high impact to the shoulder. Both rotator cuff and labrum tears generally will not heal themselves. Seeing your doctor and massage therapist, and following a prescribed treatment protocol will see that the shoulder returns to somewhat pain free movement. A small percentage may need to look at surgical intervention if the shoulder continues to be a problem after diligent exercise. Walk up the Wall stretch – Face a wall about three-quarters of an arm’s length away from it. 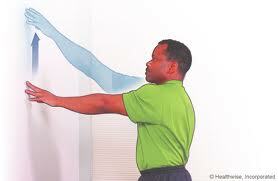 Using only your fingers (not your shoulder muscles), raise your arm up to shoulder level. Perform sets of 10 to 20 exercises at each session. 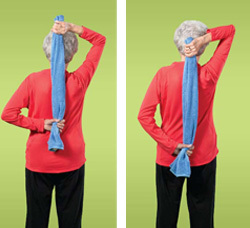 Towel Stretch – Grasp a towel behind your back with your affected side being the lower hand. Gently pull your lower hand up your back. Hold for 10 count. Repeat 5 times. Once these can performed with a good pain free range of motion, we can progress to strengthening (see my next post). Previous post: Are You Rusting?